The above group shows early arrivals at the reunion of the 69th O.V.I. Army of the Cumberland, at Memorial hall Wednesday. 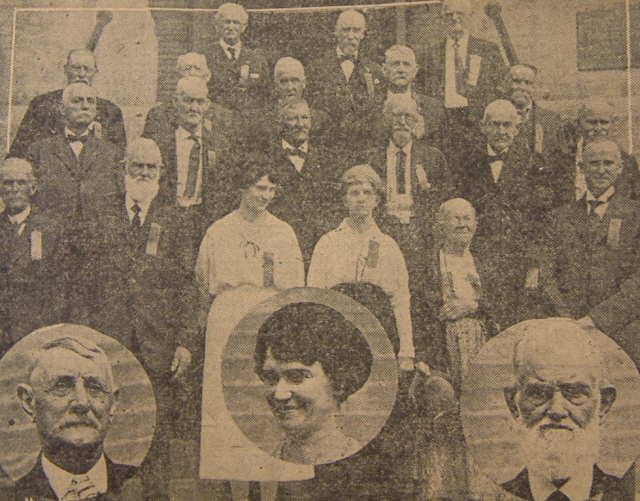 First row left to right: George B. Robson, John S. Chapman, president; Mrs. R. H. Bader, secretary; Mrs. C. M. Prets and Rev. W. S. Bell; second row, left to rifht: Louis C. Mahan, Jerome Jordan, J. D. Iddings. C. B. Louis and J. N. Pease; third row, left to right, James Fuller, C. K. Wilson, D. R. Holderman and Jacob Lundy; fourth row, Left to right, James A. Luker, Albert Kern and L. C. Ernstein. The inset pictures left to right shows: D. R. Holderman, treasurer; Mrs. R. H. Rader , secretary, and John S. Chapman, president.